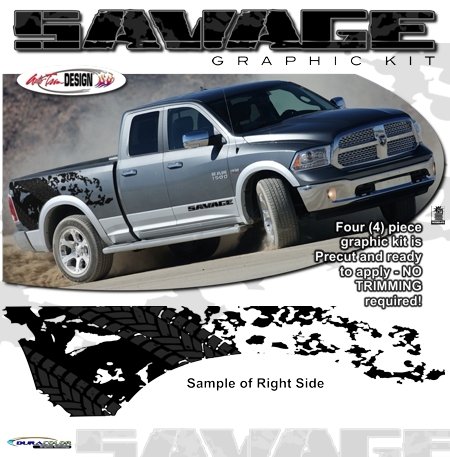 Make your '09-Current RAM Truck stand out from the rest with our unique SAVAGE Side Graphic kit. This kit is PRECUT and ready to apply - NO TRIMMING required (slight trimming required for truck boxes equipped with RamBox Cargo Management System)! Digitally printed in Black with Dark Grey tire tread elements with our DuraCOLOR graphic technology, kit is manufactured with premium automotive grade vinyl film materials. As a further step, graphic is covered with a Matte or Gloss 2 mil clear laminate which provides protection from miles of abuse. This stripe package consists of prefitted and contoured pieces as shown in the illustration. Kit includes two (2) SAVAGE badges as shown. Kit is specifically made for '09-Current RAM Truck vehicles and will not fit any other vehicle.